Huge shout-out to companies like Trader Joe’s that are making the holidays much easier for us gluten-free folks!! And allowing me to have a safe apple pie at Thanksgiving! To be honest, I don’t shop at Trader Joe’s to do my regular grocery shopping. I typically go to TJ’s for specific items (hello Everything But The Bagel Seasoning!) But, when I do go I have to peruse the aisles to see what new items they have! A few weeks ago I was running through the store quickly and saw the beautiful turquoise bag staring back at me from the freezer. 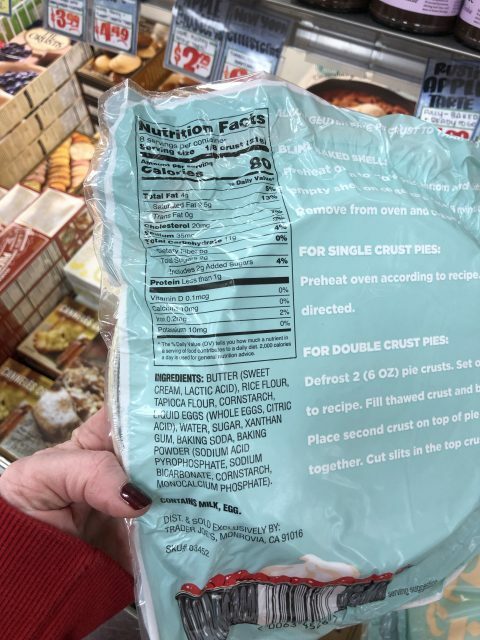 Then I noticed it said gluten-free pie crust!! The pie crusts are priced at $3.49 a piece so I picked up a few of them. I actually hadn’t seen these posted from any of the gluten-free groups I’m a part of online, so I was super excited to find them! 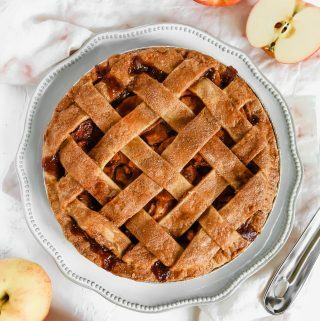 I had previously made a really delicious and simple apple pie filling for another recipe I was working on, but I decided to scrap that recipe. So I thought I’d try it using these pie crusts and see how they worked out. My mind immediately went to seeing if I could re-purpose one of the pie crusts for a topping. I let one of the crusts thaw and then I took it out of the disposable pie tin it came in. I rolled it into a ball, pulled out some parchment paper, floured it and starting rolling to see how it would work. It rolled out beautifully and didn’t break at all. This adjustable rolling pin really helps to keep it even! I then cut it into 1-inch thick strips to place as a lattice design on the top of the pie. Here is a great article and video from Saveur about how to make the lattice design. It may look hard and intricate, but it’s really not. I can’t compare this crust to any other pre-made gluten-free frozen crusts because, to be honest, I haven’t tried them. But I am very pleased with how this turned out! The dough was very easy to work with. It also cooked all the way through even on the bottom, which I can think can be hard to do regardless if it’s gluten-free or not. One minor thing that I did notice about it is that I do wish it was a little bit sweeter, but maybe I just have a massive sweet tooth! For the price, and the convenience when trying to make your own pie, I would highly recommend this crust! I also have one more very important tip about apple pie (or any pie in general)…always use fresh whipped cream on top!! There is no need to even bother with the the store-bought stuff because there no comparison to the real thing! This incredibly easy recipe for whipped cream from Live Well Bake Often is absolutely delicious. 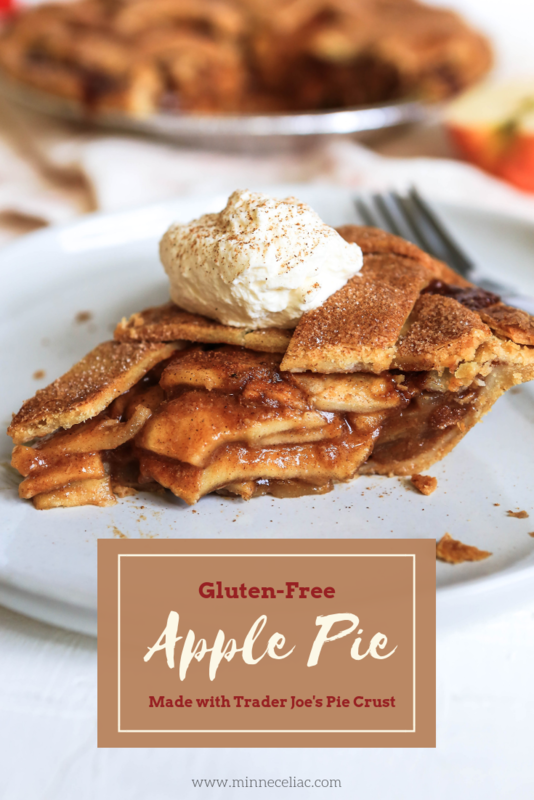 This gluten-free apple pie is sure to be a hit at any Holiday gathering. I used two Trader Joe's gluten-free pie crusts for the bottom and to make a beautiful lattice design on top! 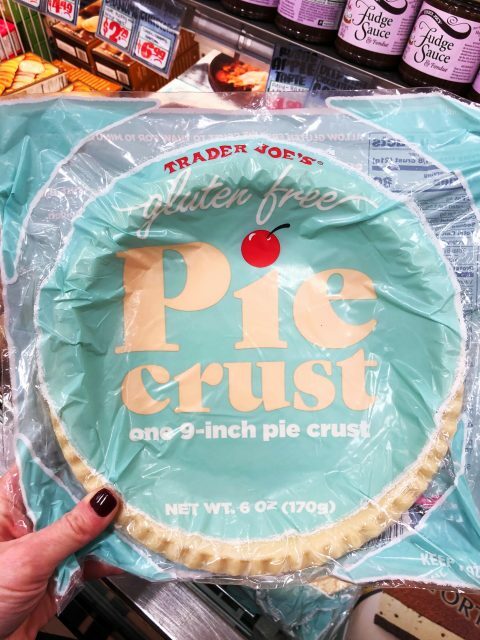 Take two pre-prepared gluten-free pie crusts (such as Trader Joe's) out of the freezer and thaw on the counter for about 20 minutes. Peel, core, and cut six (6) medium apples into thin half circles. Certain types of apples work better for pies. I used Honeycrisp apples for this recipe. Add apples to a large bowl and pour the juice and zest of one lemon over the apples to fully coat them. This will help to prevent browning. In a separate bowl, whisk together the brown sugar, gluten-free flour, pumpkin pie spice, and cinnamon. Pour this dry mix over the apples and completely coat the apples. Heat the apple mixture over medium heat on the the stovetop for about 10 minutes to help the apples soften up a bit before baking. Note: Make sure all the juices from the bowl make it into the pot! Remove from heat and let cool a bit while you work on the pie crust. Remove the other pie crust from the tin it came in. Roll the dough into a ball. Lay out parchment paper on the counter. Flour the paper and the rolling pin. Roll out the dough into an approximately 9-inch circle. Cut the dough into 1-inch strips. You'll need about 10 strips. Layer apples into the pie crust (keep the pie crust in it's disposable tin it came in). Once again, make sure all the juices from the pot make it into the pie. Cube 3 tablespoons of cold salted butter and scatter over the top of the apples. Brush egg wash along the edge of the pie crust. An egg wash is just one egg plus one tablespoon water whisked together. Place the dough strips in a lattice design on top of the apples. Remove excess crust along the edge of the pie. Finger pinch the lattice strips with the bottom pie crust. 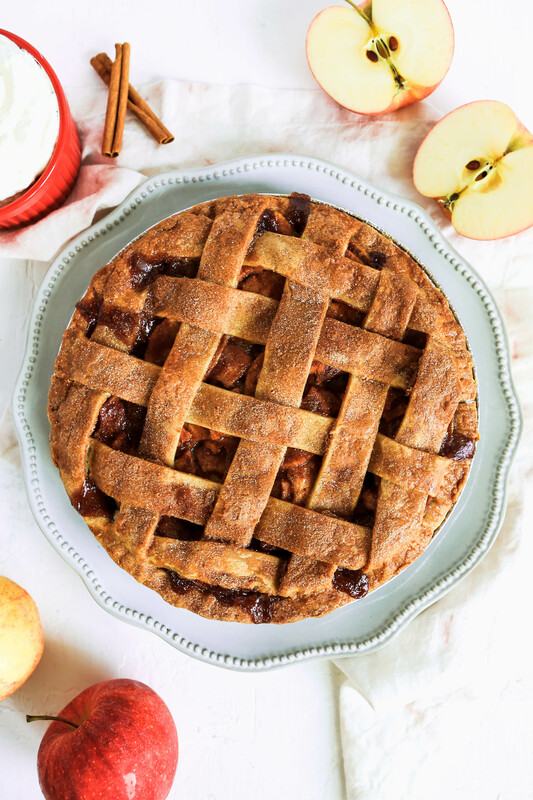 Sprinkle the top of the pie with a little extra cinnamon and sugar! Place the pie in it's disposable tin on a baking sheet (to prevent spillage) bake in a 375 degree oven for about 45 minutes until golden brown and bubbly. Let the pie cool completely before cutting and serving. Guess what? 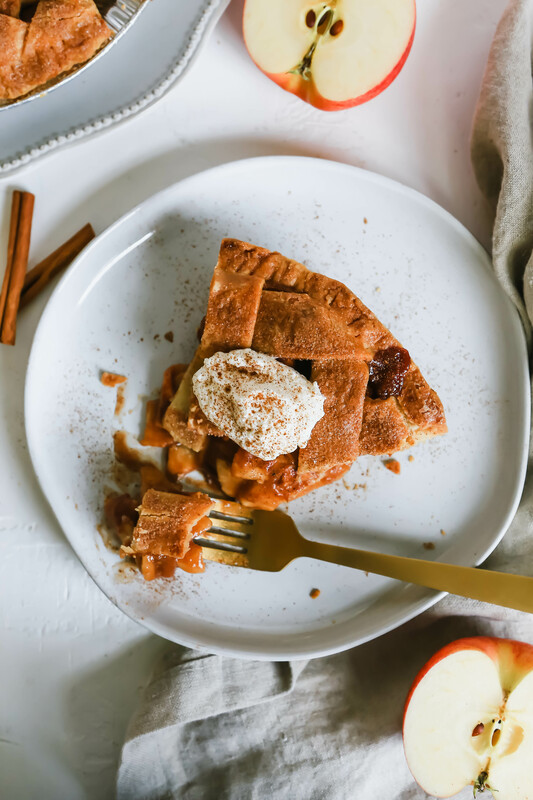 There is still plenty of time to head out to TJ’s and buy a couple of pie crusts so that you can bring this apple pie to the holidays. You could even bake this the day ahead! I know I say this all the time, but no one will even be able to tell it’s gluten-free! You can PIN this recipe by clicking on the photo below.